WALKOUT FOR GUNS: Oxbow High School seniors Dylan Downing and Kodi Dyke led a true student-led protest and press conference with about a hundred fellow classmates on Monday afternoon. 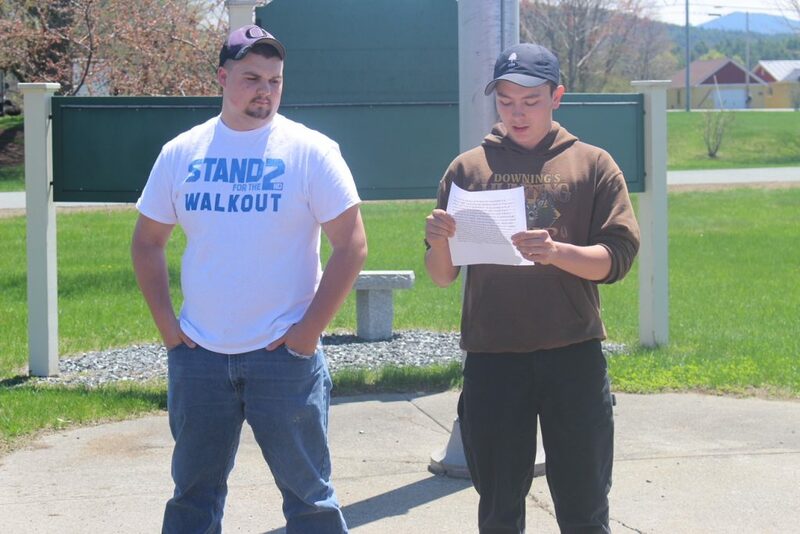 BRADFORD, Vt. — On May 3 across the nation, students walked out of schools in support of the Second Amendment. The demonstration was largely a grassroots effort, but few media outlets showed up to carry the students’ message: Guns are a constitutional right and must not be infringed. It was a sharp contrast to the youth walkouts for gun control as tied to influential figures such as New York City’s former mayor Michael Bloomberg. 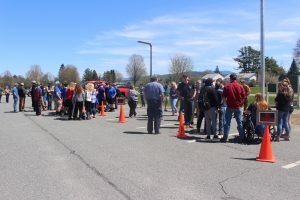 Although several schools participated throughout the state, Oxbow High School, located in Bradford, was the only Vermont school to register and be listed on the event’s official website. Oxbow held its event a week later, on May 7, to adapt to exam schedules. 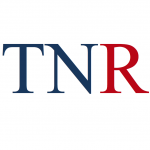 On the national level, “Stand for the Second” was organized by high school senior Will Riley of New Mexico, who says the right to bear arms cannot be taken away. “He decided that he needs to step up and start a walkout as a repeal against the other walkout that we had,” Oxbow senior Dylan Downing said in his speech delivered at the walkout. PROTEST: Students take a stand for their gun rights by walking out of class and gathering in the Oxbow High School parking lot. In the Oxbow High School parking lot, Downing and senior Kodi Dyke conducted a press conference in front of about a hundred of their peers. “We are students that are standing up for our rights and the Second Amendment,” Downing said. “We believe that the natural right for self-protection shall not be infringed simply because some individuals have used some firearms in the past for senseless attacks. He suggested better surveillance, more security guards and trained armed teachers are a ways to protect against attacks. “Protecting our natural rights, which are protected by the Constitution, is just as important, and that’s the message we are trying to send today,” he said. Dyke called for his peers to take action. One of the few staff to come outside with students was Kevin Lawrence, a teacher from Newbury. He works at the River Bend Career and Technical Center, which is attached to the school. He said he was happy to see the kids demonstrate their rights through the walkout. He compared this movement to some of the recent youth rallies in Montpelier, which were organized against gun rights. He and other students noted there was no loudspeaker announcement such as there was for the gun-control rally earlier this year. While most of the students were rushed inside shortly after the speech was over, about a dozen students hung out to chat with True North. Carissa Lasure, a sophomore, said she felt this was an important demonstration. “I feel like if our voices aren’t heard then nothing is going to be done about it,” she said. Gabe Gray, a senior, said he safely uses guns to hunt along with his family. “I feel pretty good that my voice is being heard and being part of a movement,” he said. However, senior Isaiah Shumway said he was asked to go back into the school early, but he declined out of a sense of fairness. “They gave the other group walking out fifteen minutes, and I felt it was all right to have the same amount of time,” he said. 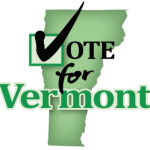 ← Statehouse Headliners: UVM Medical Center abortions, self-defense shooting numbers, minimum wage, and a VT Rush Limbaugh? My son participated in this, I am extremley proud of him & his friends. Did the Burlington Free Press report this? How about dippy little home town rags like the Milton Independent or Colchester’s? Vermont Digger? Seven Days? Hardly. They have their agendas. The far left puppet, mainstream media won’t cover this story, that’s for sure. My congratulations to these young adults. They make much more sense than the paid for little ‘hoggs’ clan even start to understand. These young people represent the future of VT and our country. And cudos to their parents and families for bringing them up with the understanding of the constitution and common sense. I’m extremely proud of all the students that participated in the walkout. There’s hope for this State yet. 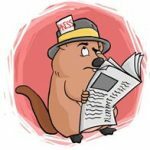 I had one Burlington Free Press editor email me after I complained about the coverage that was held in Montpelier, he stated that there would be equal coverage in the future. Well, the student walkouts and rallies for more gun laws received three of more full pages of coverage with photos for a solid week. There was a just a three inch paragraph on page 11 in the BFP for the students that walked out for the 2nd amendment. I guess that’s their interpretation of equal coverage. Stand tall kids and keep up the fight. We are behind you. Too bad these great youngsters (not kids) don’t get money such as that oink oink oink kid from FL gets to fight the anti-gun snowflakes received from the liberal likes of Soros, Winfree, G. Cloney et al. Seems some youngsters have American values. Way to go! We are proud of you. Brave Individuals willing to Stand Up! We are So proud of you …Future Leaders of Our Free Country! Please read all you can about Our Rights and Be Strong in Believing in Yourselves. I know they didn’t teach you much about the Constitution but you know it’s yours and thats a Start. 🙂 Always Remember you will run the government. ..by the consent of the governed…. continue to be Strong and protect Our Freedom at any cost! Way to go kids! Glad you’re standing up for what YOU believe in. Excellent job! Glad to see there are more than just my kids who have been taught by their parents that guns are not evil. Bravo! Some young people we can be proud of!! Thank you!! 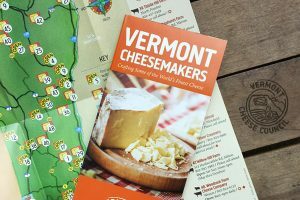 Great job, young Vermonters. The right to bear arms and defend self are fundamental human rights. Thank God there are SOME parents who are raising their children right. I applaud these very brave kids who are standing up for their rights and the Constitution against the very leftist… Communists, if you will…..who are poisoning others’ minds. REAL men!!! REAL women!! Unlike the marches against the second amendment that paid people to March and bust in people to attend these events. We know these marches were paid for by George Soros and Michael Bloomberg as well as organized by them. I can’t thank these students enough for having the common sense to stand up and defend our Second Amendment to the Constitution which they know if so important to keeping America alive. They realize we are the last free country on the face of the Earth and understand the gun ownership is an important part of keeping us free. May God bless each and every one of them. you will not be silenced by liberal rhetoric about firearms. coverage from the Liberal news outlets ………….Keep up the good work, it’s your future. Don’t worry about the snowflakes, like all snowflake they will melt away ! !